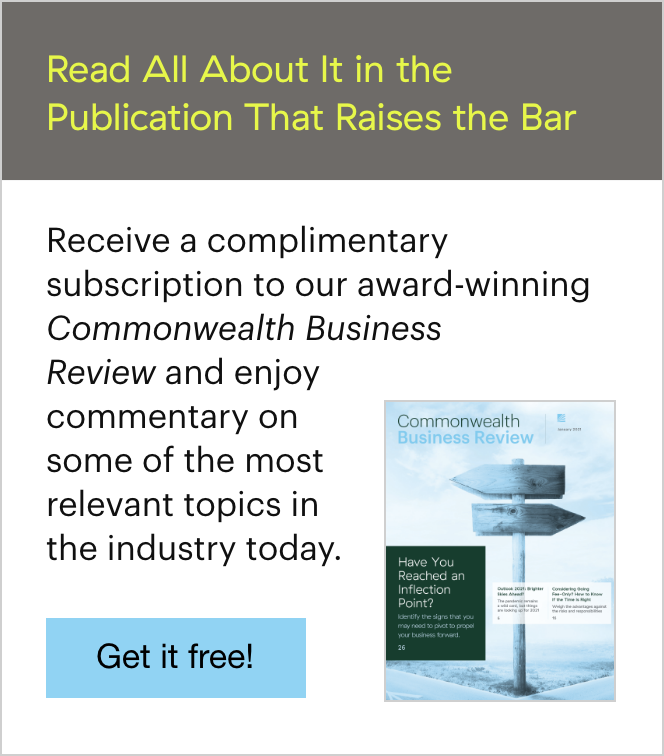 Over the last few years, Commonwealth’s Practice Management team has observed a troubling trend: many advisors deciding to sell their practices with very little forethought. Unfortunately, by not allowing themselves enough prep time for such a major decision, these advisors could be leaving money on the table. If you’re looking to maximize the value of your practice, consider giving yourself at least five years before the potential sale. What should you spend that time doing? Figuring out what you want, what you have, and what you might need to change to get what your practice is worth. Are you selling a book or a practice? Selling a book is harvesting cash flow, a relatively simple calculation. Selling a practice, on the other hand, involves harnessing the intellectual capital and business equity of a firm to create value. Have you thought about your exit strategy? Do you want to retire and sell the entire practice, or do you want to phase out your involvement over time with incremental partial sales? What does the next chapter look like for you? Where will you get social or intellectual stimulation? What is your business value? Contemplate what durable competitive advantages you’ve created with your practice that are actionable and repeatable by others. What makes your practice best in class? What do you want for your clients? Most advisors look for a successor firm that will provide seamless integration of investment and service philosophy, as well as technology tools. What is your number? What do you need to support your retirement lifestyle? How much, after all the intellectual capital you’ve put into your practice, is it worth? The next step in the preparation process is to focus on four key tenets—business, management, financial, and market—that can help maximize the value of your practice. Establishing excellence across these areas will enable you to demonstrate that you have built an intrinsically sound enterprise that has the ability to excel and earn profits. 1) Business. When assessing your practice from a business perspective, determine how you score on the major levers of your business. Value proposition: What makes you and your firm special, and why do clients choose you? Address what it is within your practice that has differentiated you from other advisors in the area. If you’ve developed a vision statement for your business, much of the value proposition can be derived from it. Brand: When selling a practice, look at branding from the viewpoint of transferability. Is your practice named after you, or does it have a more business-like name? If your family name is in your firm’s name, consider rebranding. Revenue attributed to a person has less value than revenue tied to a firm. If the practice is bigger than you, shouldn’t that be reflected in the brand? Niche: Do you focus on a specific market? Specialization is a key differentiator in what makes practices unique and valuable. Sellers often overlook this and fail to communicate a niche in detail to potential buyers who either already focus on the same niche or want to add this expertise to their practice. Systemization: If you were to walk away from your firm for a month or longer, would it survive without you? The ability to demonstrate actionable and repeatable processes in your client service model is paramount. Be sure to document how you and your staff provide indispensable service with efficiency. Exhibit ways your firm leverages technology to provide client service, capture data, follow up, and perform marketing initiatives. Your passion for client retention will be attractive to the sophisticated buyer. Scale: Scale is allocating and optimizing resources (including people) to drive the greatest results and volume across a practice. As pricing pressure will likely be exacerbated by the new DOL regulations, as well as increased competition from robo-advisors, firms that are able to redirect efforts and compete with specialization and value will be more attractive to potential buyers. Staff in small firms can have a large impact due to the multiple and varied tasks they perform, which free up the advisor to do what he or she does best: working with clients. 2) Management. Client relationships and practice transferability are what drive value. Common wisdom suggests that you maintain a minimum threshold of 90-percent retention. Why? Investments aren’t unique, but people are. The team you have supporting your practice and making it easy to do business with you is why clients remain loyal. There are three variables in particular that will contribute to your firm’s value in this area: your book, where assets are housed, and the post-sale transition. When valuing your book, be sure to delineate and spotlight clients and advocates you have developed relationships with over your career. Clients are those who believe in and act on your recommendations; advocates are those who become raving fans of you and your practice and will talk about you to anyone who will listen. These key households are your most profitable revenue sources and important in retention. Vetting potential buyers who are already affiliated with your broker/dealer enhances the potential for client retention and therefore the price of your practice. Keeping the sale internal means that most accounts can be transferred without having to re-paper them. Conversely, selling to an advisor from another broker/dealer would likely require new paperwork for every household and account—which creates challenges from both a time and retention perspective. Also, keep in mind that helping to transition relationships to the new advisor is both imperative and delicate. Will any key client-facing staff be moving to the new firm? Will you be staying on for a period of time to help introduce clients and advocates to their new advisor? You cannot overcommunicate to your key households prior to the sale—or after, as you follow up to reaffirm the benefits of the transition. It can take anywhere from three to nine months for this post-sale transition. 3) Financial. The true value of your practice lies in its ability to generate future cash flows. Whether you’re selling your practice now or in the future, take a financial snapshot of your practice at least annually to help you make more educated decisions. Revenue: Start by listing top-line numbers such as total assets, assets under advisory, insurance, and health care. Next, break down cash flow in two separate dimensions: 1) fees, securities, consulting, insurance, and health care and 2) recurring and nonrecurring. 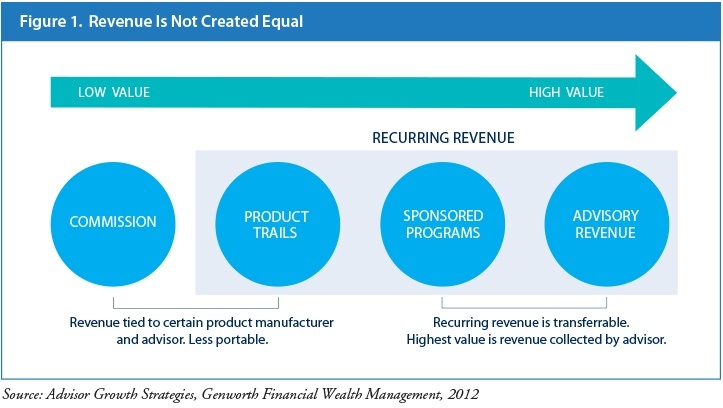 Keep in mind that not all cash flows are created equal, and where your revenues come from will affect your firm value (see Figure 1 below). Finally, exhibit the prior five years of revenue, calculating your compound annual growth rate to show how your practice is advancing. Practice demographics: Looking at a breakdown of your practice from an asset and a client viewpoint is important to measuring future viability. Traditionally, breaking these two factors by age bands (<30, 31–50, 51–70, 70+) visually shows the client/asset base and its growth potential. The 51–70 band tends to be attractive to buyers, as these individuals and their financial decisions tend to be top of mind. Client overview: A client overview aids in looking at what goes into servicing the practice, as well as developing return-on-investment assumptions. Listing metrics such as total clients, total households, number of fee clients, top 20 percent by both assets and revenue concentration, average tenure, net new revenue, and corporate clients will aid in displaying the breadth and depth of a practice. Expenses: As you know, it’s not what you earn but what you keep that’s important. Expenses to onboard and retain clients should be quantified, if possible. 4) Market. Financial practices should be viewed through a current business lens. 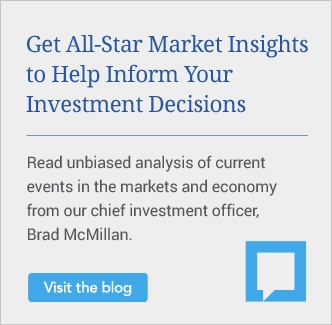 Assessing key risks and opportunities in light of current market conditions can help clarify an exit decision. Your practice’s location and its proximity to larger metropolitan areas, as well as other advisory practices, is one factor to consider. Tracking recent buy-sell activity and the market specialty of those firms (e.g., financial planning, wealth management) can give you an idea of whether it’s a buyer’s or seller’s market. Finally, a SWOT analysis of industry events that will affect your practice (e.g., the DOL rule, industry advances) should be evaluated. 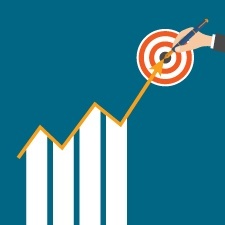 If your goal is to sell your practice, start early by examining the four key tenets and using your financial snapshot as a continual measure of the attractiveness of your firm to potential buyers. Keeping time on your side will enable you to negotiate from a position of flexibility and strength. What is your long-term plan for your practice? What other steps would you take before selling your practice? Please share your thoughts with us below!